Everyone wants to have youthful looking skin. Unfortunately, the most expensive skin care creams, with all their claims can't turn back the hands of time. However, don't despair! Prevention is better than cure. There are steps that we can all take to make sure our skin looks healthy and stays wrinkle-free for as longer as possible. All we have to do is invest some time and care in looking after it. If you already have a few wrinkles, the secret is to hydrate and plump the skin tissue as much as possible so as to fill and reduce the appearance of fine lines and wrinkles. Before you can look after your skin properly, you need to understand it. Our body's largest organ is made up of three layers. 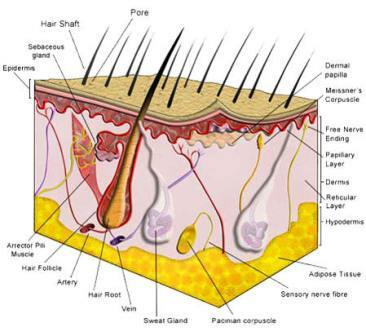 The outer epidermis contains pigment cells, the stratum corneum surface layer made up of flat, dead skin cells, and the basal layer where new cells are generated and travel upwards. The middle dermis layer contains blood vessels, nerves, oil glands, collagen fibers and elastin. The inner subcutaneous layer contains blood vessels, hair follicles and fat cells. The skin produces less oils during the winter months and in older people because the skin is less able to hold its moisture, and the number of oil-producing sebaceous glands decreases with ageing, becoming more susceptible to abnormal dryness, roughness, itching, scaling and flaking. Dry skin also occurs more frequently among people who wash their hands several times a day, as this strips the skin of its natural oils. Your 20s is a great time for your skin. You've left behind the adolescence acne, the epidermis is well toned and your skin has a radiant youthful glow. However, this is not the time to be complacent as skin cell renewal slows by up to 28 per cent, dead skin cells are not as easily shed and external factors are starting to have a greater impact, leaving your skin slightly duller. 80 per cent of all aging can be directly related to exposure to the sun. It is therefore a good idea to avoid the mid-day sun, or if you have to be out in the heat of the day then cover up, as penetrating UVA rays will start to damage collagen fibers and elastin in your skin. In your 30s skin cell turnover has slowed. Environmental damage from pollution, sunlight and smoke are take their toll on the dermis, causing collagen fibres to loosen, causing skin to start loosing its tone and develop fine lines and wrinkles. When you smile, subcutaneous fat forms ridges and refuse to bounce back as readily as it once did. By now you should have established a daily skincare regime that involves cleansing, exfoliating (two - three times a week) with AHA fruit acids, moisturising and sun protection for your skin. It is also important to maintain a healthy balanced diet consisting of fresh fruits, vegetables, grains and fish, which are high in antioxidants such as Vitamins A, B, C and E. These Vitamins counteract free radicals in your body that help the skin to repair itself, produce the enzymes that stabilise collagen production, and stay moist and healthy. For further protection, try using a day crème that contains vitamin E.
Maintain a well hydrated skin by drinking plenty of water each day to retain moisture in the skin tissue. In addition, ensure that you get enough quality sleep. In your 40s, collagen fibers decrease dramatically, break apart, and form into a shapeless, matted tangle. Elastic fibers lose some of their elasticity and thicken into clumps and fray. Causing the skin to form lines and wrinkles. In addition, loss of fat in the subcutaneous layer leaves your skin more fragile, whereas the dermis will continue to lose its elasticity. A rich nourishing day cream is a must have for your skin care regime. During this time the outer layer of the epidermis starts to grow even thicker, as dead skin cells hang around for longer. If you are not already using an AHA exfoliant or AHA night moisturiser regularly, now is a great time to get started. Exfoliating your skin regularly using a facial scrub and a moisturiser containing Rose oil, Jojoba oil or similar, as these contain natural AHA’s (alpha hydroxy acids) to help remove dead skin cells. Choose natural quality skin care products for your daily skin care regime, as you do not want to introduce unnecessary toxins into your system by using products full of chemicals. In your 50s and beyond, the hair and nails grow a lot slower. Cells involved in the immune response, dwindle in number, thus decreasing the immune responsiveness of older skin. Decreased size of the oil glands leads to dry broken skin that is more susceptible to infection. After the menopause, decreased estrogen levels mean that skin loses its tone and plumpness, and may become dry, itchy and more sensitive to allergens. Exfoliating 2-3 times a week helps to slough off dead skin cells, stimulate the circulation and prepare the skin for optimum absorption of a nourishing cream which should be applied morning and night. Moisturising with good day cream containing Collagen building ingredients also an AHA night cream to help keep the complexion radiant, this is your first line of defense, as skin ages faster when dehydrated. As we know, creams offer many active anti-ageing benefits on top of this - some claim to make skin smoother, others tighter and more radiant. Under-eye bags and dark circles can be genetic therefore there isn’t much we can do about them. For most people they are only temporary and caused by tiredness, irritations or crying. To help reduce puffiness place cold slices of cucumber or used and cooled tea bags over each eye, another trick used by many fashion models is to place a tissue over a table spoon (so you don’t stick to the spoon) that has been in the freezer and apply to the eyes or as an emergency one-off quick fix, try dabbing a tiny amount of pile cream around the eyes to shrink it temporarily. Please don't rely on it regularly as it can be very irritating to the skin. Follow any of the above with an eye cream in addition you may also apply a gel under your eye cream that contains cucumber or coffee extract (diuretic). We were all born with great functioning skin that does a really good job at looking after itself. Over washing our face or using strong detergents actually strips all the natural oils off the skin. Try using a cream cleanser as these are very moisturising and gentle with just a small amount of a very mild detergent that is required to remove only excess oil, dirt and pollutants. Our hands are constantly picking up bacteria, as pores gets clogged with dead skin cells, oils and cosmetics, constantly touching your face can cause toxins and bacteria from our hands can get stuck in the pore too, creating an infection and forming pimples. 1. Drink Water at least 8 glasses a day and follow a healthy & balanced diet and a hydrating facial spray. 2. Exercise Increased heart rate causes a more dynamic circulation and increase oxygenation of the skin and the supply of nutrients. The result is a healthier and more radiant skin. 3. Cleans As a whole most individuals under cleanse and most women over moisturize. If the skin is not thoroughly cleansed, bacteria may be present which prevents moisturizers from absorbing into the skin which causes the skin to look dull and lose luster. 4. Exfoliate These are another two important steps in improving and maintaining healthy skin. Exfoliation 2-3 times a week helps to slough off dead skin cells, stimulate the circulation and prepare the skin for optimum absorption of a nourishing cream which should be applied morning and night. 5. Moisturise morning and night to keep skin supple and hydrated.